Each and every offense that leads to an arrest is going to have a bail amount associated with it. Ranging in price, the only way for the arrestee to get out of jail is for this bail amount to be posted. In today’s blog post we’re going to cover a few of the things that judges take into consideration when deciding what the set bail amount is going to be. Whether you’ve been arrested before, are helping a loved one post bail, or you’re dealing with a criminal offense and simply need more information, we hope that today’s blog post will provide you with some insight into where these numbers come from. As you may have assumed, the nature of the charge is going to be one of the first things that a judge takes into consideration. Misdemeanors are known for having a drastically lower charge than those of felony crimes. At times, a judge will raise the price of the bail to an amount that they know the accused will not be able to afford. All of this, however, means that all felony charges result in a bail. While the nature of the charge does affect the cost of most bonds, there are specific charges that need to be considered. For example, charges that are associated with murder will often be denied the chance for bail at all. Bail could also be denied depending on the intensity of the case and the type of punishment that often follows those specific charges. The criminal record of the arrestee is another component that is going to be taken into consideration. More often than not, individuals with no prior criminal history will receive a drastically lower bail. This, of course, depends on the charges that led to the arrest as well. If the charges at hand are serious enough, you could still be denied for bail even without a prior criminal record. On the other hand, individuals with a prior criminal history will have their previous charges looked into and factored into their bail. Alongside that, individuals who are currently dealing with charges other than the one in question could be denied bail — especially if they are currently on probation. In these instances, there is usually some type of breach to parole that can affect whether or not bail is granted. A significant concern for most judges in regards to any arrests that made is the chance of flight after bail has been posted. The court appearance is without a doubt the most important part that follows an arrest. 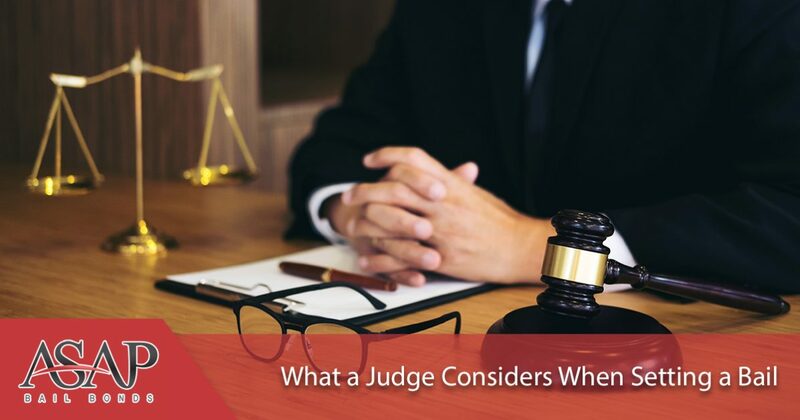 If the judge has any reason to believe that you will skip out on your court date or you have a history of missing court dates, the judge may raise your bail amount or deny you the chance of bail entirely. The last thing that the judge is going to take into consideration is very specific to certain cases. If there is another party involved in the charges of the arrestee, one thing that the judge is going to want to make sure of is that the arrestee isn’t able to interfere with any opposing parties. Whether it was an act of violence or a breach of a restraining order, the last thing that the court wants is for the arrestee to come into contact with any of the parties that are going to testify against them in court. This is another instance where bail may be denied to the arrestee, but again, is subject to the charges at hand. Regardless of what your bond winds up being, you can always count on ASAP Bonding to provide you with the assistance that you need. We are happy to provide the residents of Lawrenceville with the high-quality bail bond services they need when they need them. Contact us today to learn more about the bail bond services we offer and how we can assist you. We are the one and only call you need to make. ASAP Bail Bonding services all Georgia Counties including Gwinnett, Barrow and Cobb County. All we need to start the process is some basic information about your loved one, the jail and the court, and yourself. ©2017 ASAP Bail Bonds - All Rights Reserved.